There are few things more satisfying than a fully loaded hot dog when you’re hungry: the heat of the dog, the slightly crisp, doughy bun. The delightful blend of toppings. The way it just fills your gut when you need it most. Then again, a hot dog can be a sad affair. Imagine a slimy tube of mystery meat inside a gummy white bun, topped with high-fructose corn syrup-laced ketchup. You’ll get your cheap, filling lunch all the same, but you might want to stay within close proximity to a bathroom for the rest of the day. 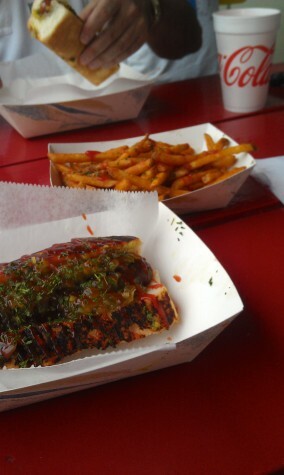 Dat Dog is a delightful hot dog shop that eradicates Fear of the Unknown Dog. They offer a lengthy selection of different kinds of hot dogs from around the world, all tucked into a steamed and toasted sourdough bun. You can choose the Smoke Sausage from Harahan, Louisiana, or perhaps veggie dog from Oxymoron (ha ha ha). They even offer a Guinness dog from Heaven! Then add toppings: 21 options at no additional cost! 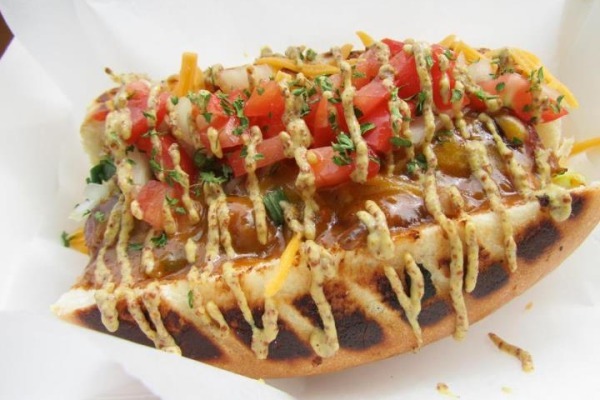 Dat Dog is a grand collaboration between former federal prosecutor Constantine Georges and his high school friend, “the hot dog guy,” Skip Murray. They reconnected after Hurricane Katrina, found an old junk shed, and turned it into a bare-bones hot dog shop. The shack has since become Sno Dog, a snoball and frozen custard stand, and Dat Dog itself has moved into a much larger space across the street. The new location has plenty of outdoor and indoor seating, kitschy artwork, and original signs from Simon Hardeveld. Be sure to check out their newly expanded bar, too! You may be in for a bit of a wait at this popular hangout, especially if school is in session. However, your sumptuous meal will be worth it. Be sure to feast on Poppy Tooker Pommes Frites and sip on house-made ginger ale. There’s no better treat after a long week, or if you’re just plain hungry. Dat Dog is surely a New Orleans classic in the making. Suzannah Schneider is a senior at Tulane University. She is a recent expert on eating for hurricane survival, and has suddenly become infatuated with pickles. oh, this just looks TOO good. I could do without the sweet relish–it’s just not for me, but I think I’m going to rip off this recipe next time we grill out Thanks for this!